​Two drawings by the late Elizabeth "Grandma" Layton are in an exhibition of works dealing with social issues through June 3, 2018 at the Nerman Museum of Contemporary Art, Overland Park, Kansas. Layton received national acclaim for her quirky, sometimes beautiful and sometimes haunting self-portrait drawings dealing with growing old, women's rights, racial prejudice, AIDS, and the right-to-die with dignity. They were exhibited in more than 150 museums across the country, including the Smithsonian. Her Kansas grandmother exterior hid what some consider a brilliant, liberal feminist. She began her art career at the age of 68 having taken only one art course. She died in 1993, having done nearly a thousand drawings in her 15-year art career which she credited with curing her years of manic depression. She gave them all away. More than 100 of her drawings are now in museums across the country. Layton's drawings in the Nerman exhibition titled "Face" are as relevant today as when she drew them 25 years ago. 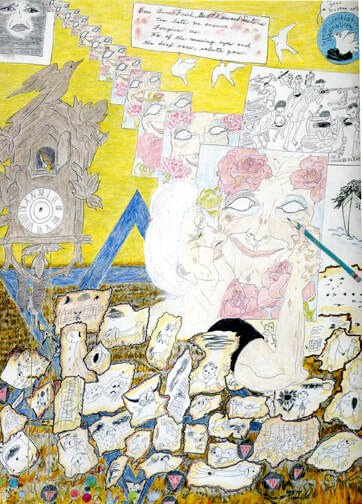 ​PANDORA'S BOX, 1979, 28x22" In this self-portrait, Elizabeth is opening the box, allowing society's ills to come out: apathy, greed, bias, fear, spite, lies, poverty and no hope. Amidst these, she added rainbows, writing ​"One tiny ray of sun hits that hope diamond and makes these millions of rainbows." ​COMMEMORATIVE TO ARTIST OF THE HOLOCAUST, 1986, 30x22" Elizabeth drew herself as artist, drawing one "pretty" picture after another. But these faces have no eyes and no ears. Meanwhile, the world around her, to which she seems oblivious, is filled with turmoil and chaos. There is the Star of David, the face of Anne Frank, pink triangles representing the homosexuals in the camps, and the charred drawings of children in the camps. The ship, the St. Louis, was filled with escaping Jews. When they arrived at the US, hopeful of sanctuary, our government would not let them in, saying we had exceeded our quota of immigrants from their country. They returned to the camps, most did not survive. Elizabeth wrote, "Dear Anne Frank, Brothers and Sisters. Too late we answer. Forgive us." ​A drawing about the AIDS crisis, Remembering NAMES by Elizabeth Layton (1909-1993) is currently on view at the Nelson-Atkins Museum of Art in Kansas City, MO. It is part of the exhibition, Face America on view May 25 - November 29, 2017. Her idea for the drawing came from The NAMES Project, the gigantic quilt commemorating the lives and deaths of people with AIDS. When the subject of AIDS came up, a neighbor said to Elizabeth, "It seems to me those people deserve to die." She had a friend, an artist, who had AIDS. She did not think he deserved to die. Rather than confront her neighbor, Elizabeth, aged 79, did this drawing. She commented, "When you are a mother and you lose a child, you understand what every mother feels at a time like this." Remembering NAMES was included in her one-person exhibition at the Smithsonian American Art Museum in Washington, D.C. in 1992. 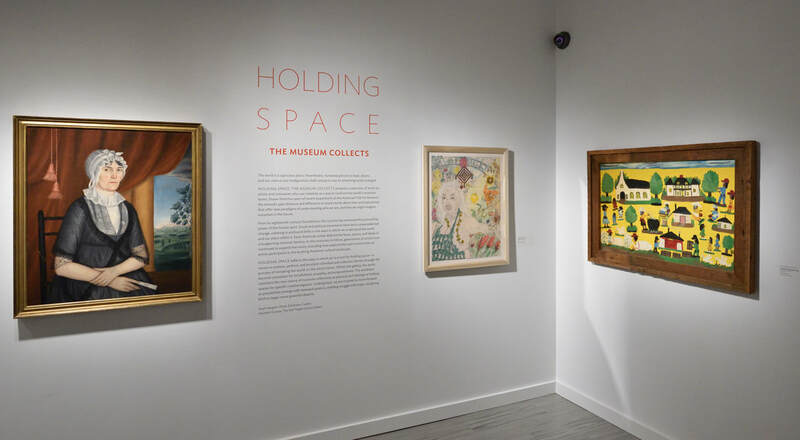 ​Layton is now represented in the collections of more than one hundred and fifty art institutions in the United States, including the Smithsonian American Art Museum. She has been the subject of features in Life, People, and on National Public Radio. Lambert facilitated the entry of several Layton drawings into the Beach Museum of Art collection. 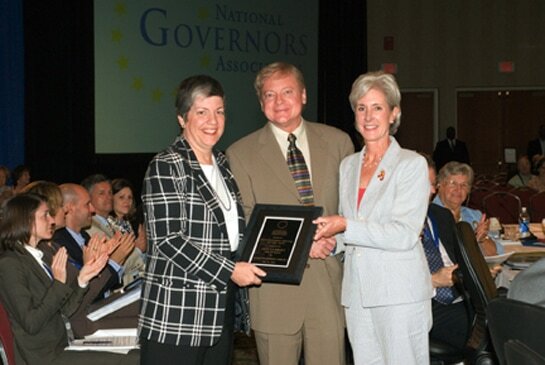 Governor Janet Napolitano, Arizona, president of the National Governors Association, Don Lambert, and Governor Kathleen Sebelius, governor of Kansas. The National Governors Association (NGA) honored eight individuals, including Kansas native Don Lambert, for contributions to public life during its 99th Annual Meeting in Traverse City, Michigan on July 21st. Annually, the NGA presents three awards to state officials, three to private citizens and two for distinguished service to the arts. This year, the Distinguished Service to the Arts’ Artistic Support Award went to Lambert, a Kansas writer, curator and advocate of the arts. “We are recognizing these individuals for the dedication each honoree has demonstrated to improving their states and the nation,” said NGA Chair Arizona Governor Janet Napolitano. “On behalf of the nation’s governors, I would like to express our gratitude for their meaningful contributions to state government.” “Don’s service to the arts in Kansas is legendary. He has helped many Kansans appreciate the beauty that surrounds us and has opened the eyes of the world to the work of talented artists from our state,” said Governor Kathleen Sebelius. The Lambert family is deeply rooted in Kansas, with early ancestors settling in Cloud County over a century ago. Don Lambert has shared his appreciation and pride for the state by bringing recognition to more than 400 Kansas artists in more than 500 locations around the country. Recently, Lambert organized an exhibit in Manhattan of 127 Kansas Artists to benefit the Kansas Park Trust. Lambert has published four books; written dozens of articles for national magazines; discovered and helped to promote artist Elizabeth ‘Grandma’ Layton, who has become a national symbol of creativity and a beacon of hope for those suffering from depression. Lambert also led a revival of Kansas-born artist John Steuart Curry, whose mural of John Brown is one of the highlights of the Kansas Statehouse. As a result of Lambert’s efforts, Curry’s wife, Kathleen, bequeathed 950 of her husband’s works to Kansas. One of Lambert’s exhibits, “Homage to the Flint Hills” featured 37 paintings and photographs of the Flint Hills. This exhibit toured Kansas for two years and was featured in the nation’s Capitol. A copy of the tour’s accompanying book was given to each of the nation’s governors by Governor Sebelius at the award ceremony. Lambert is also responsible for arranging continuous exhibits of Kansas master artists in the governor’s office. He’s a graduate of Cloud County Community College, Kansas State University and the University of Kansas. Established in 1976, the NGA Awards for Distinguished Service to State Government allow governors to bring national recognition to their states’ most valuable civil servants and private citizens. The awards emphasize the commitment of state administrators and the important contributions private citizens make to their state. The awards program is administered by a selection committee comprised of three permanent representatives from the academic community, as well as designees chosen by the NGA chair and vice chair. The NGA Awards for Distinguished Service to the Arts, established in 1980, are given in two areas: artistic production and arts support. This award recognizes outstanding service to the arts, focusing on contributions that improve the quality of life and bring distinction to a state.